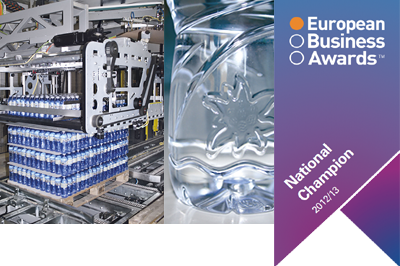 SMI S.p.A. is a National Champion representing Italy in the 2012/2013 European Business Awards! The European Business Awards has announced today that SMI S.p.A. is to represent Italy as a National Champion in the prestigious 2012/13 Awards programme. SMI has been selected as one of just 8 National Champions and will now compete for the coveted Ruban D'Honneur status in the next round of the competition. This year, for the first time, entrants in the European Business Awards submitted a video case study uploaded onto the European Business Awards website for an online voting mechanism. Over 35,000 votes were cast with one company automatically going through to the National Champion round. In addition, an esteemed panel of judges chose another 7 organisations that exhibited innovation, business excellence and sustainability to represent Italy. up to -40% in the consumption of power supply per single bottle produced. Pietro Volpi, Marketing Manager of SMI says, "We're proud to be selected to represent Italy as a National Champion. The European Business Awards is widely recognised as the showcase for Europe's most dynamic companies and we are now looking forward to the next round of the judging process". Adrian Tripp, CEO of the European Business Awards says, "This year, the video element of the awards has allowed our panel of expert judges to gain a much deeper understanding of the business strategies of all the National Finalists. It is because of this that the judging has been particularly tough and this year it is an exceptional accolade to be picked as a National Champion. Together with our sponsors and supporters we're looking forward to seeing SMI in the next round". Between now and January 2013, National Champions will be reassessed by a third panel of judges made up of Europe-wide business leaders, academics and entrepreneurs who will award the top organisations the coveted Ruban d'Honneur status. Finally, after face-to-face presentations, the Ruban d'Honneur recipients will be honoured and the names of the overall winners will be revealed at a Gala awards ceremony in April 2013. For more information on the European Business Awards, please visit www.businessawardseurope.com.